PDF Page Lock is a free PDF locking tool for Windows that encrypts and hides pages in a PDF document. Either the entire document can be locked/hidden or only specific pages. Download and install it from here. The setup is available in zip and exe format. Once installed, using it involves opening the PDF document which needs to have the pages locked or hidden. The numbers of pages will be displayed in the left column of PDF Page Lock interface. To lock a selected page, click on it and choose Lock. The page in the right side preview pane will now have a red lock icon. Similarly to hide a page completely from the document, use the Hide option. The privacy icon will be visible on that page. Now, a password will be required to encrypt the pages and save the changes. This will later be used if the document is opened again in PDF Page Lock for unhiding or unlocking pages. 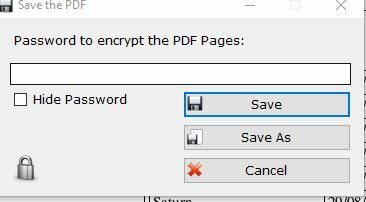 Once the selected pages are locked or hidden, save the PDF file. On opening it in any PDF viewer, the specific locked pages will now be displayed using the lock icon while those which are hidden will not be visible at all. This is a free and handy tool to have for maintaining PDF security.